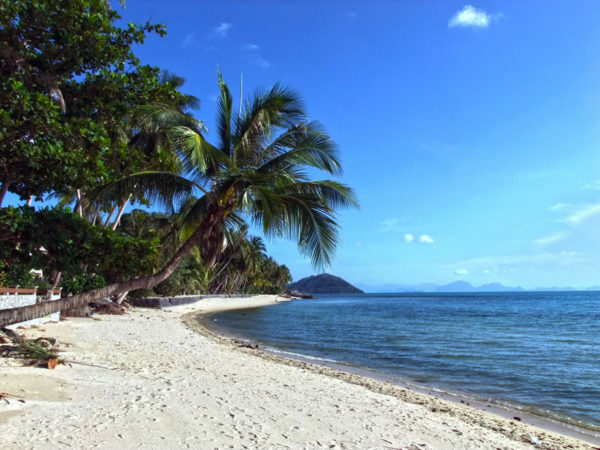 Taling Ngam Beach, located on the west coast of Koh Samui just south of Nathon town, is a beautiful and quiet area of Koh Samui. Not as developed as many areas of the island, Taling Ngam offers extraordinary views and sunsets to the west with the sun setting behind the Angthong Marine National Park’s many islands. There are several resorts and hotels in Taling Ngam, as well as an assortment of both local the international restaurants. Nearby Lipa Noi beach stretches several kilometres with unspoilt beaches, very few people and room to move and enjoy oneself. This lovely, hidden away beach is dominated by the Le Meridien Baan Taling Ngam, which climbs from the beachfront all the way up the hillside. But you don’t have to stay there to enjoy the beach – day-trippers are welcome, and Taling Ngam is a world away from much of the rest of the island. Fine swimming and sunbathing are the two main pastimes here, though a small fishing village is within walking distance nearby and more restaurants are slowly appearing in the area.